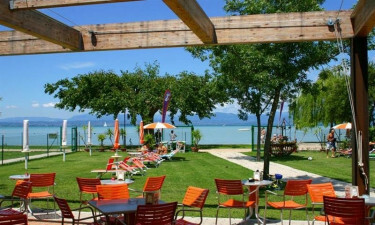 Set right on the edge of the large and lovely Lake Garda, Gasparina is a leading LuxCamp that boasts activities for all the family. While those who simply want to unwind during their camping holiday are well catered for, a good range of activities can also be enjoyed on the site. Taking a sunset stroll along the shore of Lake Garda is a luxury camping activity that families should not miss. 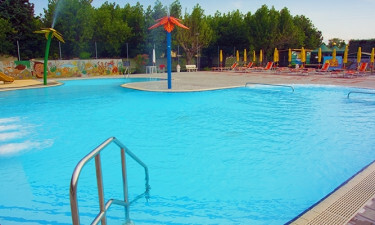 Guests can also have fun on the site by taking part in activities such as table tennis and swimming. The site’s main swimming pool is set with large sun loungers where guests can unwind in style in between splashing around. 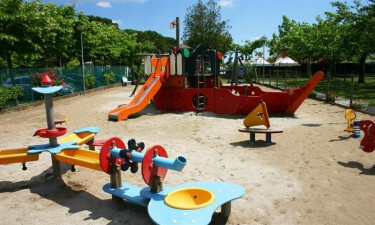 A smaller pool for children can be found in the same area, while a large and colourful children’s playground is set right next to it. After checking into their mobile home, families will want to head straight down to the beach. The sandy strip that lines Lake Garda is the perfect place for sun worshippers to unwind, while a number of aquatic activities can be enjoyed on the surface of the lake.